Essence and Energies: What Kind of Distinction? There is much confusion among scholars over the precise nature of the essence-energies distinction. Various authors have identified it as a Thomistic real minor distinction, a Thomistic rational distinction with a foundation in the object, and a Scotistic formal distinction, whereas others deny that any of these descriptions properly apply. The issue is further complicated by the tendency of some of Palamas’ closest followers, such as Philotheos Kokkinos and John Kantakouzenos, to describe the distinction as ‘conceptual’ (κατ’ ἐπίνοιαν), notwithstanding that Palamas himself seems to have avoided describing it in this way. Such varying interpretations point to the need for a careful consideration of the history and meaning of the various types of distinction at play, both Greek patristic and Latin scholastic. After offering such a history, I conclude with some thoughts regarding the ways in which Palamas’ own distinction does, and does not, conform to these various models. Martin Jugie, ‘Palamas, Grégoire’, Dictionnaire de théologie catholique, vol. 11, pt. 2 (Paris: Letouzey et Ané, 1932), col. 1735–76, esp. col. 1750, 1755–56, 1760–64. Sébastien Guichardan, Le problème de la simplicité divine en orient et en occident au XIVe et XVe siècles: Grégoire Palamas, Duns Scot, Georges Scholarios (Lyons: Anciens Établissements Legendre, 1933), 93, 105–109. The largely critical review of this work by Vénance Grumel, Echos d’Orient 34 (1935): 84–96, repeats this point without criticism. This study is a systematic effort to understand modern narcissism-without-pleasure and intersubjectivity- without-meaning, with the help of the Maximian teaching on pleasure and pain, and the Palamite distinction between essence and energies. This is, at the same time, an effort to understand tradition in the context of a lively re-appropriation of the spiritual findings of the past. In order to express this, some new terms such as inter-meaningfulness are thus created with the help of modern Philosophy. Half of this paper, in an earlier form, was published as ‘Δι-εννοημάτωσις or Inter-meaningfulness: rereading Wittgenstein through Gregory Palamas’ and Thomas Aquinas’ readings of Aristotle’, in S. Mitralexis, ed., Ludwig Wittgenstein between Analytic Philosophy and Apophaticism (Newcastle upon Tyne: Cambridge Scholars Publishing, 2015), 151–165. This half has undergone substantial changes. Charles Taylor, A Secular Age (Cambridge, MA: Harvard University Press, 2007); Rémi Brague, Le Régne de l’homme (Paris: Gallimard, 2015). This paper serves as a brief and very preliminary exploration of a fascinating and under-explored aspect of St Gregory Palamas’ teaching: the nature of the next life. While we are used to thinking of St Gregory as someone who fought for the reality of human experience of the breaking-in of the Kingdom, the eschaton, even in this life, we are perhaps less prone to ponder what he has to say about the next life. In this respect, Gregory offers a number of intriguing suggestions, notably in terms of the vision of God with the eyes of the spiritual body and human participation, not only in the Resurrection but also in the Ascension of Christ. Thomas S. Eliot, Four Quartets: ‘Burnt Norton’, I. This paper was given at a colloquium on ‘Imagining the Eschatological State’ held at Wheaton College in the spring of 2017. It stands, as I say, as a very preliminary exploration of a complex theme that deserves closer and more sustained attention than I have been able to afford it here. In the present study, which is based on Gregory Palamas’ work Περὶ θείας ἑνώσεως καὶ διακρίσεως (On Divine Union and Distinction), it is our aim to present a methodological proposal for an approach to the texts of this Christian theologian, bearing in mind, on the one hand, the preceding tradition and teaching of Eastern Christianity and, on the other, the specific thematic directions taken by the text. The central thrust of our analysis is the question of the union and distinction between the divine essence, the divine persons, and the divine energies. Moreover, through a rational organization of the concepts, we attempt to establish a theory concerning theological metaphysics in order to demonstrate that they all reflect the same ontological reality: that is, the Holy Trinity. As regards the structure of our study, we examine the following categories: 1. the uniform manner of divine creativity and a cognitive approach thereto; 2. created things are not divine ‘procession’, but the results thereof; 3. God creates without multiplying; 4. the participated exist before the participating; 5. the divine as transcending any number; 6. the divine names are not an empty sound; 7. on the kinds of distinction; 8. on hypostatic distinction; 9. on the uncreated nature of the divine hypostases. These are issues which first touch upon the field of ontology and then that of epistemology. From the position of Saint Maximus the Confessor’s eschatology, conceptual pairs which address specific theological problems, such as logoi-tropos and natural will-gnomic will, also function as mirrors of each other, together clarifying the fundamental principles of the Confessor’s eschatology as well as demonstrating the systematic character of his thought. Following the tradition of figures such as Sherwood and Zizioulas, the paper takes the opposition between Maximus’ logic of end and Origen’s logic of beginning as a starting point to describe Maximian eschatology as systematic metaphysics. The cosmic finitude of eschatology is an ‘incomplete ontology’ (Loudovikos) of crucifixion and resurrection, according to which the void of soteriological incompleteness (viz. that the creation is not yet deified) receives an objective meaning in the eschaton. The fallen tropos of being as deep ontological contingency is guided by the in- carnation of the Logos, and, by extension, the logoi, thus instantiating the ‘fundamental meaning’ (Louth) of eschatological history. In other terms, history is the eschatological antagonism between, on the one hand, the gnomic will as the reduction of freedom to the complete ontology of immanent perpetual choice and, on the other, the natural will that determines the ethical mission of man as the total transformation of the cosmos, theosis. John D. Zizioulas, Lectures on Christian Dogmatics (London: Continuum, 2008), 130. Cf. Andrew Louth, ‘Eastern Orthodox Eschatology’ in The Oxford Handbook of Eschatology, ed. J. L. Wells (Oxford: Oxford University Press, 2010), 233. In an essay originally published in 1948, Fr Georges Florovsky noted that, whereas the Orthodox conciliar tradition produced no formal definition or doctrine of the Church, this was not because of any confusion or obscurity regarding the question, but because the experiential reality of the Church was so overwhelmingly self-evident that it required no explanation.1 Yet, what may have been self-evident in the patristic and Byzantine period no longer seems to be quite so obvious, and theologians now regularly question the nature of the Church, along with its purpose and relevance in the modern world. 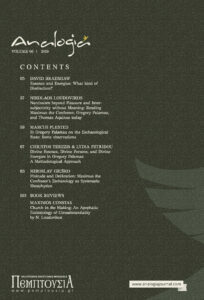 Despite the proliferation of various ecclesiological models and theories, many questions regarding the nature, identity, unity, structure, orders, and ministries of the Church remain largely open and under discussion, and these are not merely academic questions but to the contrary express a genuine and widespread crisis. Church in the Making addresses these questions in ways that are exceptionally fresh and creative, and which should insure this book an important place in the large and complex body of ecclesiological literature produced over the last century and a half. The central problem, as Loudovikos sees it, is that hierarchy and institutional structure have come to dominate the vision of the Church, and as a result have become unwitting vectors in a vicious cycle: disproportionate emphasis on the Church as an institution invariably provokes a range of subjective, spiritualizing, charismatic and therapeutic reactions. Georges Florovsky, ‘The Church: Her Nature and Task,’ The Collected Works of Georges Florovsky, vol. 1 (Vaduz: Büchervertriebsanstalt, 1989), 57; originally published in The Universal Church in God’s Design: An Ecumenical Study (London: SCM Press, 1948), 43–58; the quotation appears on page 43.